This weekend marked the 25th running of the Tall Oaks-Windjammers Challenge Cup Race, and Fortuitous sailed under the flag of the Windjammers Sailing Club. I’ve participated in this race every year since 2010, although previously exclusively as crew on Providence II. I was excited to skipper our boat against our rivals…even though I’m probably the only one who really considers them rivals. In reality, the two clubs are pretty friendly and the race is not all that hotly contested, but I have enough of a competitive streak that I started taking it personally when we were losing it every year. The omens were looking good: an animal ate my hat. I got my first Windjammers cap shortly after joining, and pretty much wore it nonstop. It had started off the color of washed denim, but over time it darkened and took on a shiny, more polished finish and seemed to be perpetually damp. Between the staining and some missing threads, the embroidered logo was barely legible. The leading edge of the brim had started to fray, possibly from rubbing on shrouds and stays while walking around boats, and my attempts at slowing the fabric loss by saturating the frayed edges with cyanoacrylate adhesive were only marginally successful. Jen thought it was gross and several club members told me that I should replace it, but I felt like it was just starting to break in and considered it something of a badge of honor. I kind of wish we handled it more like an outlaw motorcycle gang. Every Angel recruit comes to his initiation wearing a new pair of Levis and a matching jacket with the sleeves cut off and a spotless emblem on the back…These are his “originals,” to be worn every day until they rot…Many of the jackets are so dirty that the colors are barely visible, but they aren’t discarded until they literally fall apart. The condition of the originals is a sign of status. It takes a year or two before they get ripe enough to make a man feel he has really made the grade. My hat made the grade. Then it crossed a line. In a semi-delirious state following our cruise to Atlantic City, I must have dropped it while unloading the truck. When I went out for work the next morning, I found it in our driveway, chewed up and covered in hair and slobber. It was a goner. 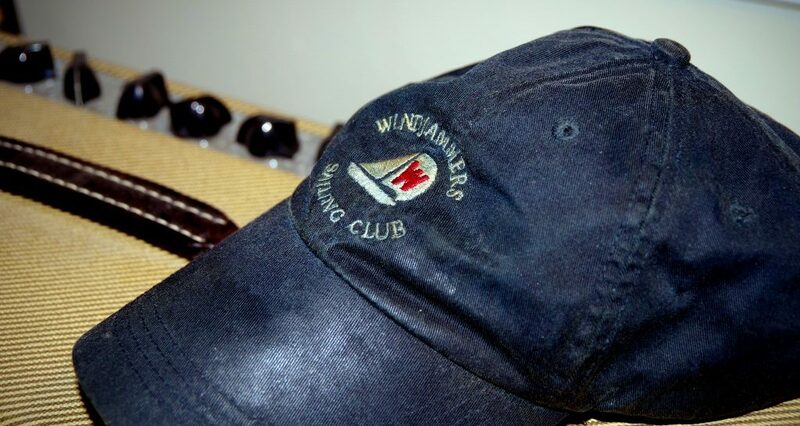 The timing of this incident—between our watershed sail in the Atlantic and the Tall Oaks race—imparted some sense of graduation, even if the death knell for my hat didn’t occur during an elaborate club vs. club brawl involving weaponized winch handles and splicing fids. I also stopped shaving before the race, either in a feeble attempt to feel more barbarous and intimidating or in direct repudiation of the stupid scene in All is Lost where Robert Redford decides to shave instead of preparing his damaged vessel for the obviously approaching storm. I probably looked more like a high school sophomore in week twelve of a beer purchasing campaign, but suffice it to say that I was excited to race. …although not enough to set an alarm. Jen and I woke up right around the time that we were supposed to be leaving to make the 0900 captains’ meeting. We got out of the house as quickly as we could and skipped our planned supply run in favor of speed. They’d moved the captains’ meeting up an hour to allow the Tall Oaks skippers time to return to their marina, so we had time to shop after the meeting. We got there as the meeting was finishing up and I was able to sign in late. My penance was to set the leeward mark, although I did take the opportunity to buy a new hat while I was in the clubhouse. Sailor Steve met up with us and helped me get the boat prepped while Jen went to the combination florist/liquor store: your one-stop shop for getting drunk and apologizing for it. The course was a windward-leeward arrangement, two laps with the marks about 2nm apart and a committee boat in the middle. I was a little concerned about our sailplan—while there was zero wind in Cedar Creek, we were getting hit with gusts to 18kts in the bay prior to the start. In the summer I would have assumed that the sea breeze was starting to kick in and would have reefed, but it was from the northeast and I decided to just flatten the main by tightening up the outhaul and vang. I figured we could shorten the jib with the furler if necessary. This turned out to be the right call, although it was a little wild there for a bit. I’ve never done a start with that many boats and the gate wasn’t all that wide, so I kind of hung back. I think at one point in the starting sequence, the other 14 boats were all in one clump heading toward the line on starboard, while we were sailing the other way. Ever the inspirational skipper, I remarked to my crew “Hmm, everyone else is going that way…we must be doing something right.” As it turned out, it wasn’t our best start but it wasn’t completely botched either. We hit the line with speed just a few seconds behind the pack, who mostly continued on starboard. We tacked immediately and went for the less popular side of the course—we specifically looked before the race started to see if there was a favored side, but it all seemed about the same so we chose clean air. We gained time on Sashay (one of our fastest boats) on the first leg and actually beat them to the windward mark. I thought that I had time to clear it, but misjudged it and they had to sail wide around the mark to accommodate our relatively slow 225° tack. I apologized both then and after the race, but they were fine with it—one of the benefits of team racing. Steve was quick with the pole set, considering our less than optimal pole situation, and we were off running wing and wing downwind. At that point, I was glad that we hadn’t reefed. We were stuck between a Hunter 34 and a Catalina 34 from Tall Oaks, and through some strange bending of physics, they could not pass us. They had 6 and 8ft of waterline on us, respectively, and should have been crushed us downwind. The Catalina moved in directly astern to try to blanket us, and when he gave up on that and futilely tried to pass us to port we could actually hear them saying, “We block his wind and he just goes faster.” I have no idea what was going on, but Fortuitous continues to prove to be a scrappy boat in a fight. The Catalina was overlapped with us at the leeward mark and we had to give them room, which put them in front of us for a moment, but as soon as we established ourselves on windward we were pointing higher and sailing faster and eventually passed them. On the ensuing legs, I’m not sure that there was much we could have done better. The crew was firing on all cylinders and I don’t think we made any tactical mistakes. There are always little things that you can do here and there, but we ran a tight race. The only problem was that the wind was steadily dwindling. In PHRF racing, this is an advantage for naturally fast boats, since they can complete the course with wind, and a slow boat’s rating isn’t enough to make up for the fact that they’re crawling to the finish line. While we wound up beating a lot of theoretically faster boats straight-up without correction, it wasn’t enough to put us up in the top third of finishers, which is where this sort of race is won. Since this is a team event, the winning club is determined by scoring the corrected finishing positions: you get 1 point for coming in first, 2 for second, and so on, and the club with the lowest score wins. Since we only fielded 5 boats to their 10, Tall Oaks got to discard their 5 slowest scores. For the Windjammers, Sunset came in 3rd, Sashay came in 5th, and Fortuitous came in 6th. I don’t have the complete list of results yet so I’m not sure where our other boats finished, but with Tall Oaks boats occupying 1, 2, and 4, we lost by a handful of points and had to give the trophy back to TOYC. Despite the results, I’m really proud of our efforts. We had the boat sailing fast and made no egregious errors. We fought off some boats that, by all rights, should have mopped us up. The crew was awesome and carried over a lot of the efficiency that they’d established in Distance Race. If the wind had stayed up we might have placed higher, but that’s racing. There’s always next year, and by then my new colors will have possibly just started to break in.